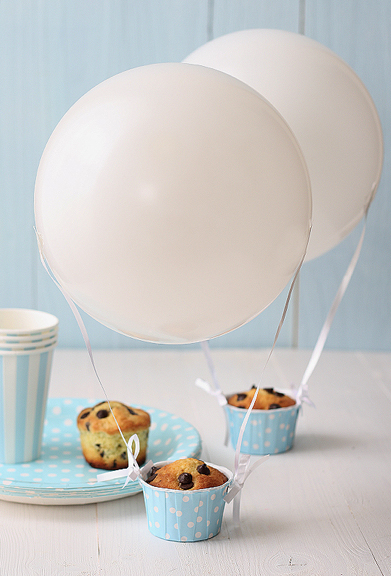 These balloon muffins might be the funnest idea for serving muffins, or cupcakes, at a birthday party ever. Even if the party doesn't have a hot air balloon theme. You can get the recipe for these yummy chocolate chip muffins and see more details on the hot air balloon cupcakes over at La Receta de la Felicidad. PS - If you scroll to the bottom of the blog there is a button to translate it to English for your reading pleasure. Um...hello...aren't those just the cutest! What a fun idea. You know you can jump with those to liners filled with jellybeans, or m&m's or so much more. Great party idea!